The Zéta folk dance group was formed in 1983. First choreographer was Mr. József Csombok the leader of folk dance group of Visznek. He was followed by the member of Vidróczki folk dance group. From 1991 to 2002 Mr László Ágoston, then from 2002 to 2007 Mr István Buborék were the leaders of the group. The present leader is Mr Imre Bagossy. Thanks to the permanent teaching and training of more generations the folk dance section today belongs to the best ones of the county. For more than 10 years they organize the one week folk dance camp in Balatonalmádi every year, where they process the traditions of certain hungarian historical regions. The members of Zéta folk dance group and those youngsters who would like to join the group take part in this camp. During the camping period they introduce themselves in the Jacht camping in Balatonalmádi and on the Stage Móló. Since 1991 they constantly perform in transborder cities like in Tordaszentlászló, in Buzita, in Szepsi, Transylvania and in Slovakia. Thanks to the traditional Polish-hungarian friendship they are also permanent guests of the international folk dance festival in Poznan. They were also seen at the cultural debutation of World exhibition in Hannover in Germany. They have been to Marciano, near Rome, in Italy. And also they have been to Eriche and to Trapani in Sicily, which is part of world heritage. City Pontevedra, Spain, organizes the world dance meeting every year, on which the people from old Spanish empire take part. At this world dance meeting the Zéta folk dance group took part and they could show and perform the hungarian folk dance culture in front of thousands of people. They also have been to Istambul and taken part at the European dance Festival, among turkish, georgian, macedonian, lithuanian and russian folk dance groups. The aim of Zéta Folk Dance Group of Adács is to know, to show in and to propagate the folk dance culture of the Hungarian historical regions. We think it is important to empasise the uniformity and variegation of the Hungarian folk dance culture. There are traditions, dances from more historical regions in the programme of the group: lőrincrévi pointer, Verbunk from Szatmár, dance in pairs from Mezőség, girl dance from Kalocsa, Trans-Danubian jumping dance.Countywise and national and transborder performances followed each other in the past years. On the occasion of Saint Jakab’s day we organize the festival called „showing in the folk dance culture of Hungarian historical regions” at the end of July in Adács every year. Transborder Hungarian folk dance groups are our guests this day. There were groups here from Transylvania like from Szamosújvár, Ördöngősfüzes, Tordaszentlászló and from Uplands like from Abaújszina and from Szepsi. We also invited gropus from more settlement of Vajdaság. During the festival we organized and exhibition of the objects from the guest groups’ cities, showing the traditional agriculture equipments. We try to improve the programme with some craftsman trade activity and dance house. The particiapants of the festival go the neighbouring villages of the county. They show their dances at Dobó square in Eger, at the main square in Gyöngyös and on the saint’ day in Felsőtárkány. We organize our traditional folk dance camp in Balatonalmádi at Lake Balaton every year, as we did in 2004 and in 2005. Our aim is to know the folk dance culture of a certain historical region and nake new choreography. We perform on Móló stage in Balatonfüred and in Jacht Camping in Balatonalmádi. 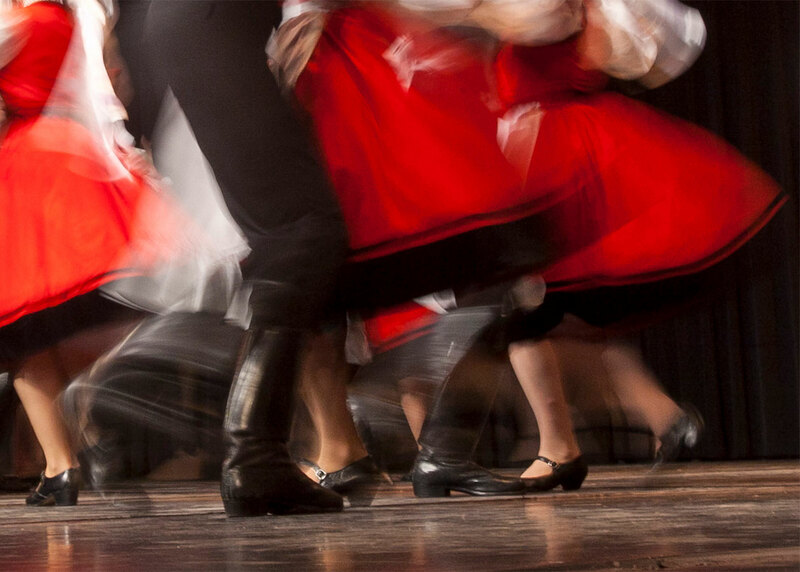 We think it is important to propagate the hungarian folk dance culture in countries of Europe. We were Nagykikinda of Vajdaság in 2004 and we were in Tuarano in Italay in 2005. We had common performances with European, Asian and Central American folk dance groups. We were in town Przemysl in Poland Galicia together with Cultural delegation of county Heves in 2006. In 2007 we were the guests of the Bulgarian National Dance Academy in Balchik in Bulgaria. We could know the life and historical monuments of hosting countries and we came home with a lot of useful knowledge. During the past years the Zéta folk dance goup had a generation change and became significantly younger. It is also important for us to deal with reinforcements and to have the folk dance culture be known and loved by youngsters. We divided the children into 2 gropus and they learn the base of folk dance. We have traditional programmes repeated every year, like the „show in of folk dance culture of the hungarian historical regions at the end of July. Our guests are from transborder countries, from Transylvania, from Uplands and from Vajdaság. Adács is a small village at he foot of Hill Mátra and its citizens are kind and hospitable people. On the day of Saint Jakab’s the number of citizens of the village are doubled. We prepare a so called folk hotel in the local elementary school. This is the accomodation for our guest gropus and we use the military beds given by the war office minister. The audiance of the Saint Jakab’s day gala programme can see a cheerful performance on the open air stage. Our supporters are the local government of county Heves, local government of Adács, and the Course of the National Cultural basse programme. Our guests visit Eger, Gyöngyös and Felsőtárkány. Zéta Dance group was formed at the same time together with the folk dance group 20 years ago. The group deals with showing in classical and modern dances and with processing them. They regularly go abroad to perform, so they have been to Slovakia, Transylvania, Germany, Italy, Sicily and Poland. And in summer they are at Lake Balaton. In Jacht Camping in Balatonalmádi, Móló Stage in Balatonfüred. They also appear at the wine days in Balatonfüred and on 20 August. The County Cultural Centre organizes the Heves county Dance gala in Adács every year. Csemadok, around Kassa region, invites the group for all memorable events, so we are regular participants of the transborder Katalin’s day ball. The main duty and task of the group is to maintain and show in the dance traditions. The leaders of Adács support the group with pleasure, because with these performances they carry on the fame of Adács. They took part at the national festival 2000 programme series with the programme called „with culture at the gate of The west”. They represented county Heves and they gained the seventh place. They appeared at the County Gala in Gárdonyi Géza theatre in Eger, on 3 December in 2000.